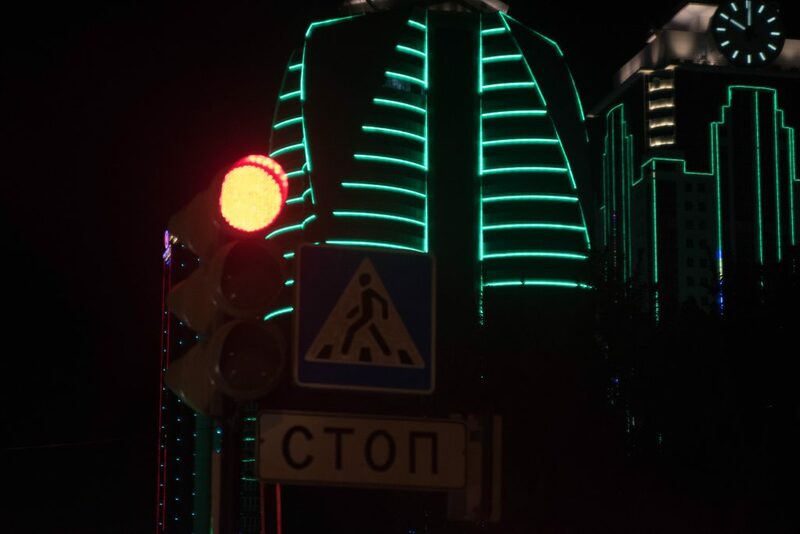 One night in Grozny, the capital of Chechnya. Yes, I have certainly not been looking forward to this part of my route. My original plan was actually to go from Georgia to Iran, Turkmenistan and Uzbekistan. But the Turkmen embassy decided to make so many mistakes when dealing with my visa matters that I had ended up with finding a Plan B and applying for the visa for Russia to make a detour around the north of Caspian Sea. When I got the Turkmen visa in the end I had enough of the back and forth and decided to be stubborn and go via Russia. Still I was not very enthusiastic when it was time to leave the fantastic Caucasus in Georgia in exchange for weeks of desert and step. What I didn’t consider too much before taking off was the fact, that I would go into Chechnya. After a short online search for places to stay on the way it turned out that lodging until arriving in the Russian city of Astrakhan could be rather difficult. Grozny was actually the only city I could find any hotels. Without thinking twice I booked a room in the only hostel in town and the events took their course. 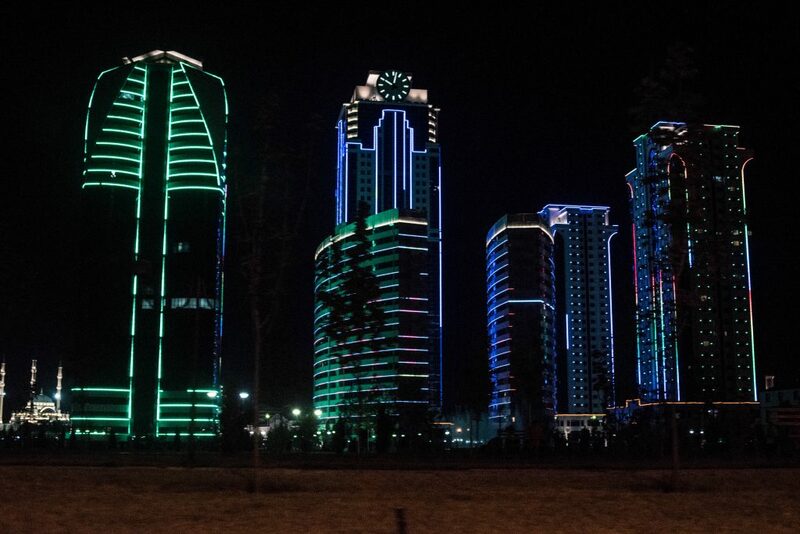 Skyline of Grozny at night. As soon as I had crossed the border from Georgia to Russia not only the landscape changed from lush green mountains to dusty plain land all of a sudden, but also the security checks. So far I had not been stopped once by the police, but the Russians made sure to ruin this good experience properly within less than 150 kilometers. Five times I was stopped and checked – mostly friendly and with a smile, twice by somewhat grimmer policemen. I guess one of them probably expected some bribes – he took my passport and registration papers and put them deeply in his pocket. Then he started to talk to me in Russian with a very harsh voice. I didn’t even have to pretend because I really couldn’t understand a word. Instead I smiled and kept repeating the cities I planned to go to next even though my heart slipped into my pants. After very long 10 minutes he probably had enough of dealing with this stupid foreigner and waved annoyed to make me go on. Of course without returning my passport. I pointed to his pocket and reluctantly he moved my documents out of there. My hostel over the garages in Grozny. The guy probably just working on stealing the ac from my room. I love hostels – not only because they are cheap, but also a good way to get in contact with other travelers. Throughout my career of traveling I have stayed in many adorable and cozy hostels and quite a bunch of really horrible ones. But I never spent a night in a hostel that you could compare with the one in Grozny. 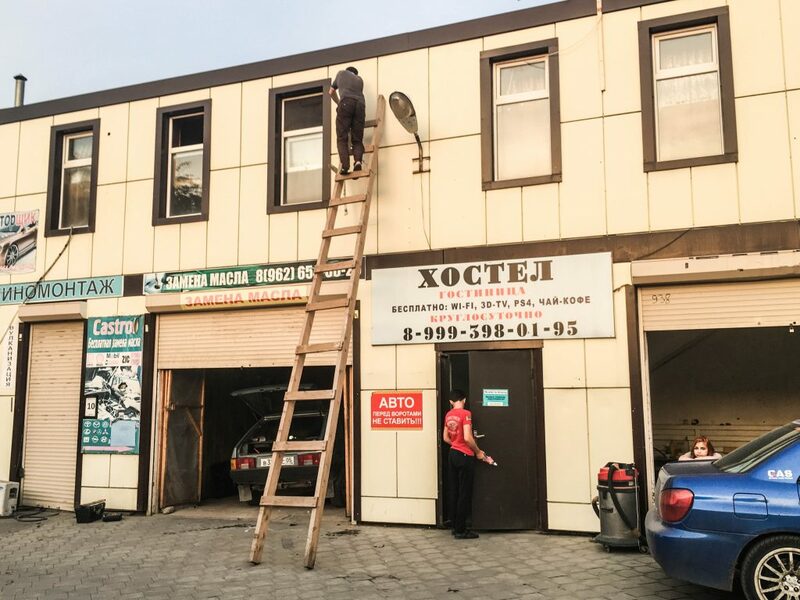 It is located directly above a garage and car cleaning station and all scrap carts of Grozny seem to get their excessive sound systems and underbody lighting there. When I arrived I realized quickly that this place was a bit different to the ones I am used to as a traveller. Not too many Western tourists might ever have stayed here and of course nobody was speaking English. Normally you always find a bunch of younger people, here it were entire families with their children. My efforts to get a room on my own (even though I booked it in advance because I need a bit of privacy all in a while) failed and not even Google Translate was a help. So I ended up in a room with another girl that had nothing more than two dresses, two scarfs and a denim jacket as her luggage. When showing me my room the owner of the hostel pointed out that we were really lucky because we had air conditioning. I nod gratefully – the temperature outside had exceeded 40 degrees. All rooms shared one bathroom that was separated from the corridor only by a curtain. So much for the privacy I planned to have that evening. 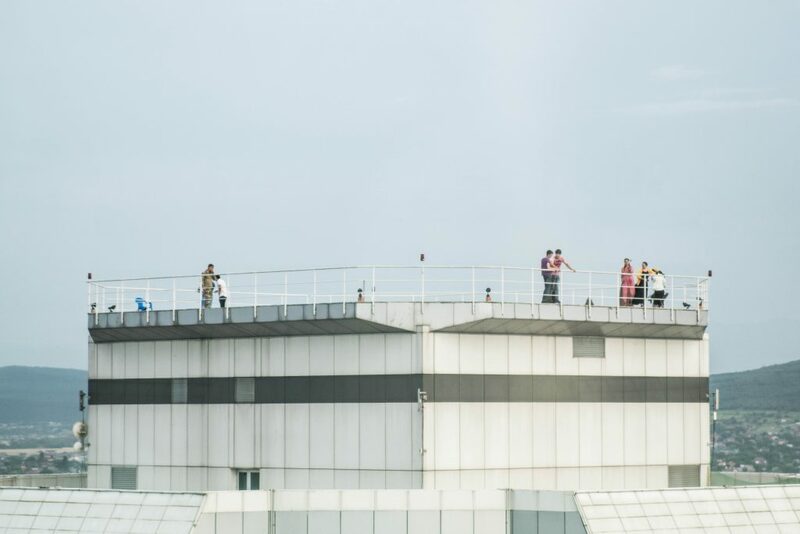 Level 36 of the skyscrapers in Grozny for a better view of the city. I was hungry, so I decided to head to the center of Grozny. Also because I wanted to find an ATM to withdraw money. The owner of the hostel lent me 100 rubles to buy a bus ticket, but I couldn’t find the station. At one point I gave up and decided to take the chance for a stroll in the burning heat. All the people I walked past looked at me with a mix of indignation and horror. A few cars stopped and the drivers starred at me or were trying to take a picture. And when I saw several women in a small alley I suddenly realized what was wrong. I was the only one not wearing a headscarf. Luckily I always have a scarf with me and I quickly covered my head. But I felt quite uncomfortable from that moment on. Nevertheless, I strolled further to at least take a look at the Akhmad Kadyrov Mosque, with 10,000 seats the largest in Russia. It is named after Akhmat Kadyrov, the former mufti and President of the Chechen Republic who was killed in a bomb attack in Grozny in 2004. Besides of that not very charming mosque the only other real sight of Grozny seems to be the supposedly largest fountain in the world, which has an area of 40×300 meters. Grozny craving for these superlatives didn’t make it more charming for me at that point. On the other hand it’s as well hard and unfair to accuse a city for it’s lack of sights if you consider that it was bombed to pieces 15 years ago. But each of these attractions with the background of their construction left a stale taste. Even though I was properly dressed with wide trousers, covered shoulders and my headscarf now, I was constantly addressed by some men. I still hadn’t found an ATM and my hunger got even worse, so I seeked a refuge in Grozny’s 5 star hotel (the night costs not more than 60 euros), probably the only place that served food before the sun going down because it was still Ramadan. When asking the lady at the reception if wearing a headscarf is demanded in Grozny she told me that they would prefer that their female guests have one – even though it’s of course no obligation. Hanging in the garage of my hostel in Grozny. When I got back to the hostel I was pretty much done with Grozny and only wanted to go to bed to leave the city early the next morning. But I stumbled over two Russian girls from Moscow, who apparently lived in the hostel, but were not just guest. They were working in the garages and washing the cars passing by. 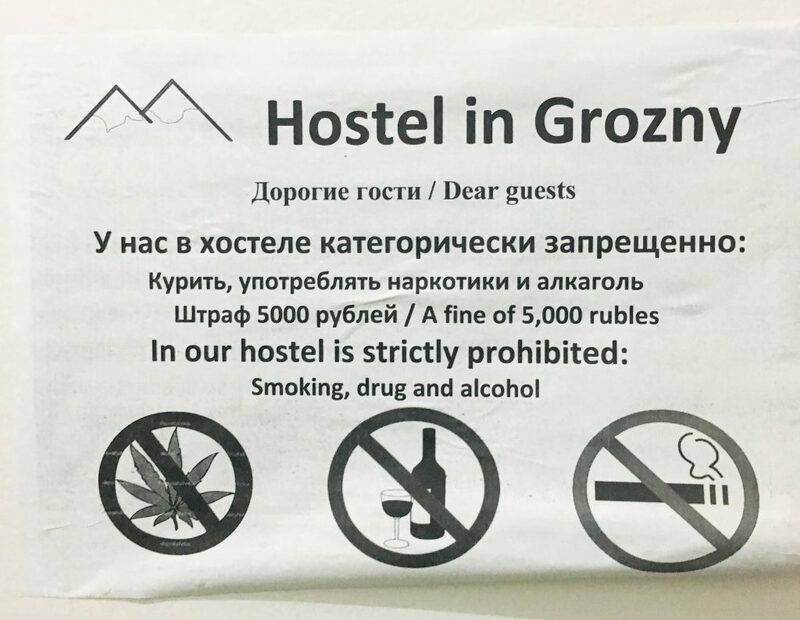 No smoking nor drinking in Grozny. 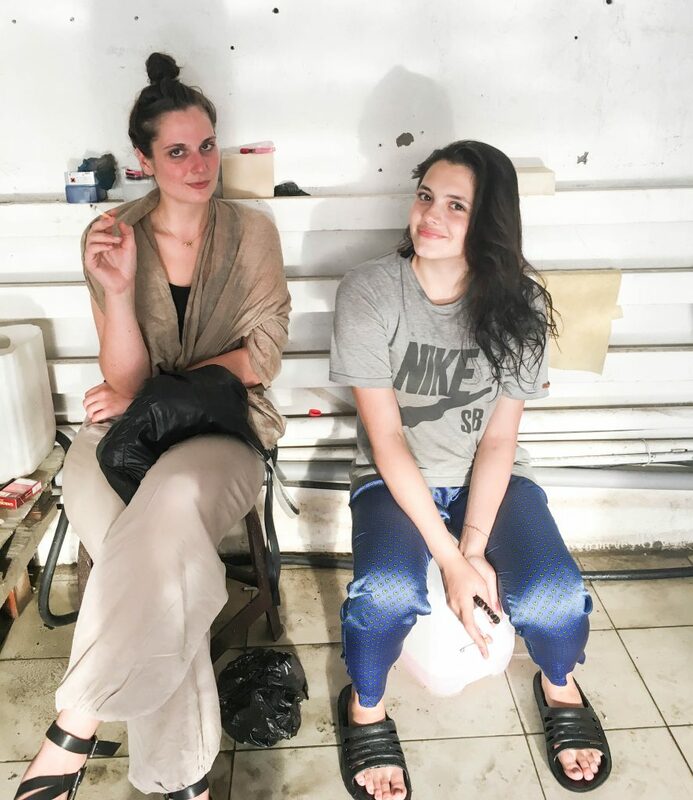 The girls didn’t speak a word English, but they were holding me back from entering the hostel. One of them eventually pulled me in one of the garages and offered me a cigarette – in here we were allowed to smoke and put off the headscarfs. After communicating with hand and feet for quite a while I started to relax a little. I realized how tense I had been after dealing with all those police controls and staring men. The girls started to dance to the deafening music of the cars sound systems – and this was the first time this whole day my smile was not fake. Taking a breath and trying to recover of the driving style at some red lights. As night falls the owner of the workshop approached to me. He pointed to his car. The girls nodded encouragingly and pushed me towards the door. I looked around to seek for help, but nobody else took a notice of what was going on. They left me no other choice than getting in his car. And as it turned out he had no intention to kidnapp me. He simply wanted to show me the city at night because he had heard that I would leave early the next morning. With a speed of 120 km/h he took me on a rollercoaster trip through downtown Grozny. I got seriously sick of his driving style, but the queasy feeling that I have had from the minute I entered Grozny and that was probably based on me being so badly informed about the region, finally disappeared. Instead I was overwhelmed by the friendliness and curiosity that I experienced. From the neon-lit skyscrapers to the far too bright illuminated Akhmad Kadyrov Mosque those sights at night were burned intensely to my memory. Not because of their beauty, but because of the ups and downs of emotions that I had lived through in Grozny. When we came back to the hostel it turned out, that somebody had removed the air condition from our room to the hallway while I was gone. Yes, it was definitely time to leave this town. Wonderful goods from you, man. I’ve understand your stuff previous to and you are just extremely great. I actually like what you have acquired here, certainly like what you are saying and the way in which you say it. You make it entertaining and you still take care of to keep it wise. I cant wait to read far more from you. This is really a tremendous web site.